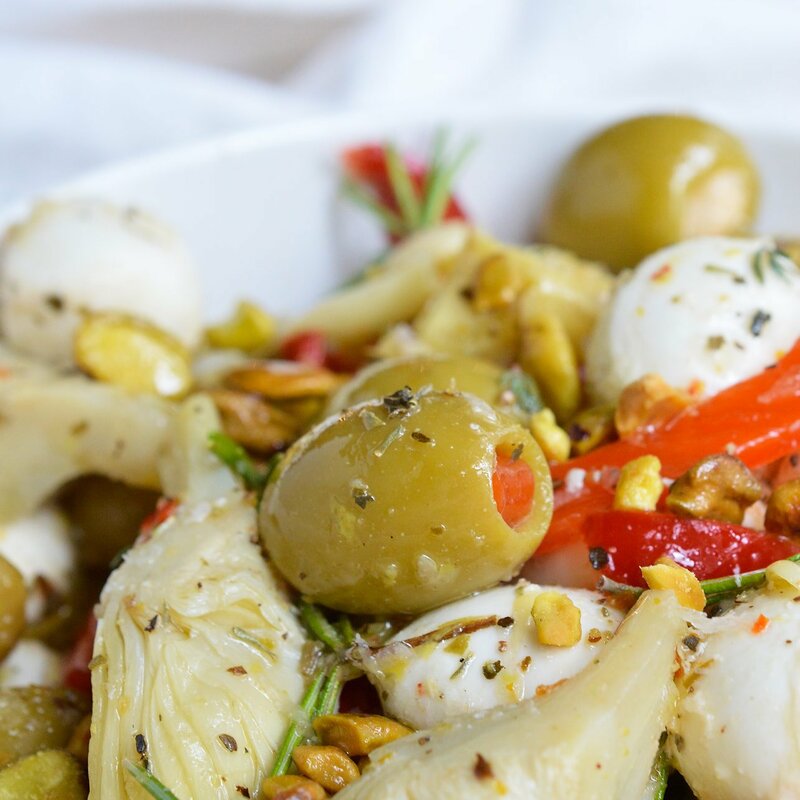 For a quick and easy appetizer, make these Marinated Mozzarella Balls, Artichokes and Olives. 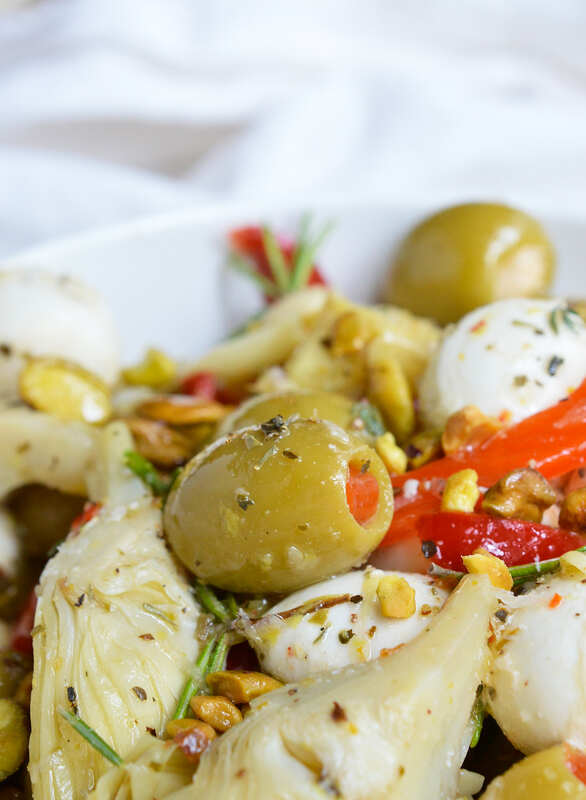 This appetizer recipe is full of garlic and fresh herb flavor. 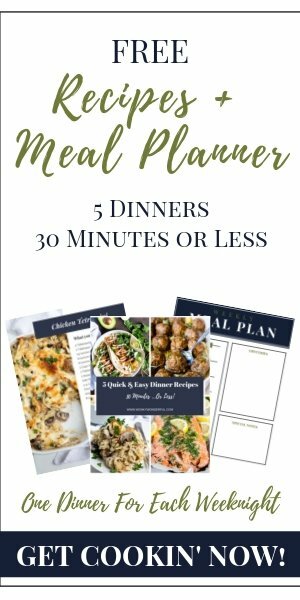 Perfect for serving at holiday feasts and parties! This. This right here is my weakness. Sure, I like a good piece of chocolate cake. But my real weakness is salty, briny and cheesy. 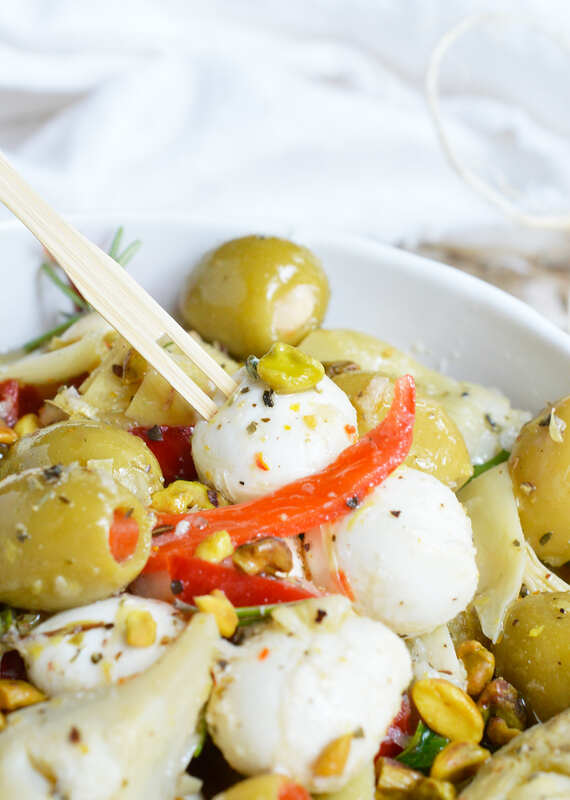 Any day that ends with Marinated Mozzarella Balls, Artichokes and Olives and a glass of wine is a good day in my book! The marinade is full of garlic, lemon and fresh herbs . . . so this is gonna taste fantastic! Second most importantly it is ridiculously easy to make. Just mix up the ingredients and let it do it’s thing. Tasty and lazy . . . that’s how I roll. 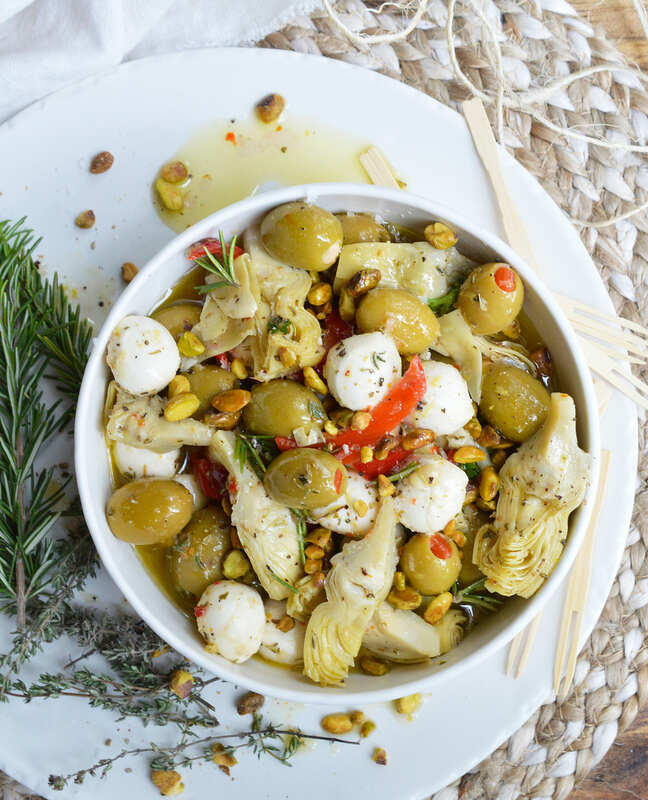 The quality of the ingredients is extremely important for this Marinated Mozzarella Balls, Artichokes and Olives Recipe. Use good olive oil, fresh mozzarella, nice firm olives and your favorite Italian seasoning blend. I use Two Snooty Chefs Italianno DE Capri because it is amazing! This, a glass of wine and some crusty bread and I am set. My idea of the perfect dinner. Yes, I want to eat appetizers for dinner. If you like this recipe you may also be interested in my Lemon Thyme Marinated Olives or Artichoke & Roasted Garlic Dip. Combine olive oil, vinegar, garlic, Italian seasoning, herbs, lemon zest, salt and pepper. Gently toss artichokes, mozzarella and olives in mixture until evenly coated. Marinate 30 minutes before serving. If not serving within 2-3 hours, mix everything except cheese then add mozzarella shortly before serving. Store in the refrigerator if not serving immediately. This is best served at room temp. Your buttermilk vanilla cake recipe is what I’ve been searching for, it’s perfect. I love the flavor,texture, and the simplicity of this recipe and it works beautifully in high altitude.. Do you have a chocolate recipe that will give me the same results,but is just as simple as the vanilla? I’ve baked this cake using a cream cheese frosting and a caramel frosting to a very particular group of people and they went crazy!!!!! I thought I’d let you know that the Two Snooty Chefs Italianno DE Capri is unavailable on Amazon’s site (used your link). I signed up for the alert in case they make it available again.